Do you know what too much sitting in front of your PC does to your body? With everything becoming digitized, work is becoming increasingly deskbound. Your tasks these days probably involve extended periods of time spent in front of computers. You may spend all day on your gadgets. Sitting all day can do irreparable damage to your body, How do you recognize that your body has suffered the effects of sitting for too long, and more importantly, how do you counter them? Spending hours sitting at your desk without a break can cause anyone to feel restless. If you recognize any of these signals, you have probably sat down for too long. Moving our bodies generates blood and oxygen flow. A constant influx of air to the brain keeps our minds sharp. Sitting for too long disrupts this flow, and our ability to focus. Further, being in a slumped position strains your neck and spine. It destroys cells in the back and shoulder muscles. Improper posture also contributes to back pain and damaged vertebrae. Movement expands and contracts the discs between them. Moving about allows the inflow of blood and nutrients. Sitting for too long makes the disks compressed and uneven. Herniated lumbar discs happen in people who sit for extended periods of time. Since sitting does not require you to use all your muscles, they become flaccid. You will develop a condition known as swayback or the lengthening of the spine. Your hip muscles, in contrast, will become short, tight and tense. Your organs will begin to degenerate as well. Conditions such as cardiovascular disease come about because you are inactive. Your heart cannot pump if blood flow to it is sluggish. Regular movement introduces antioxidants, which prevent free radicals from building up. Of course, sitting for too long may prevent blood from circulating in the legs. The lack of circulation results in swollen ankles and varicose veins. Regular walking, or even standing keeps them healthy and thick. A study showed that people who spent too much time in front of the TV had a 64% chance of dying early. Sitting down causes decreased muscle contraction. It prevents fat from clearing and lowers the effect of insulin. In short, your metabolic rate slows. You do not use major muscle groups when you sit. The reduced energy expenditure and metabolism leads to decreased calorie burning. Sitting down forces your pelvis to rotate backward. It also puts pressure on the lumbar discs. This awkward position pushes your head forward, so your shoulder will curve to make up for the weight transfer. Being desk-bound, with only a computer to accompany you will shrink your social circle. Your feelings of depression and loneliness increase. Your Vitamin D levels, conversely, decrease, as you do not go out enough. Studies show that people in low-physical activity occupations have a higher propensity to contract breast cancer. Wei Zheng et al. found more occurrences of breast cancer among women who had office jobs than those whose occupations were physically demanding. In all, sitting for too long lowers your mortality rate. A study found that sitting was responsible for 6.9 deaths. 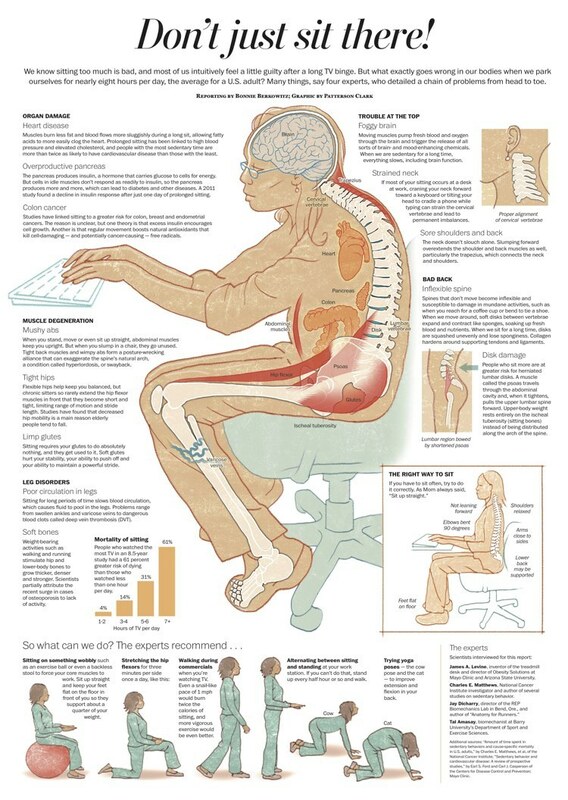 You have probably realized that sitting all day can damage your body. But how much sitting is too much? Studies show that sitting for too long can cut your life short. Researchers from the Harvard Medical School and the Louisiana State Universitywent through five studies that involved nearly 167.000 people between 4 to 14 years. The data included their sedentary habits, and the researchers took particular note of how many hours they spent sitting. The results indicated that people who sat for more than three hours a day reduced their mortality rate by two years. Having a deskbound job does not mean that you have to become a victim of the effects of too much sitting. All you need to do is balance sitting with a little standing, and movement. For a start, you can construct a stand-up desk, one that allows you to do your work comfortably while standing. Besides being able to reduce the risk of weight gain and obesity-related diseases, they eliminate back pain as well. A study published in the Occupational Environment Medical Journal reveals that standing desks help a person burn up to 170 calories. And then, exercise regularly. Regular workouts will counter the effects of sitting for too long. Move around in your seat to keep your blood circulating. Have walking meetings with your colleagues. They save time and will keep everyone active. 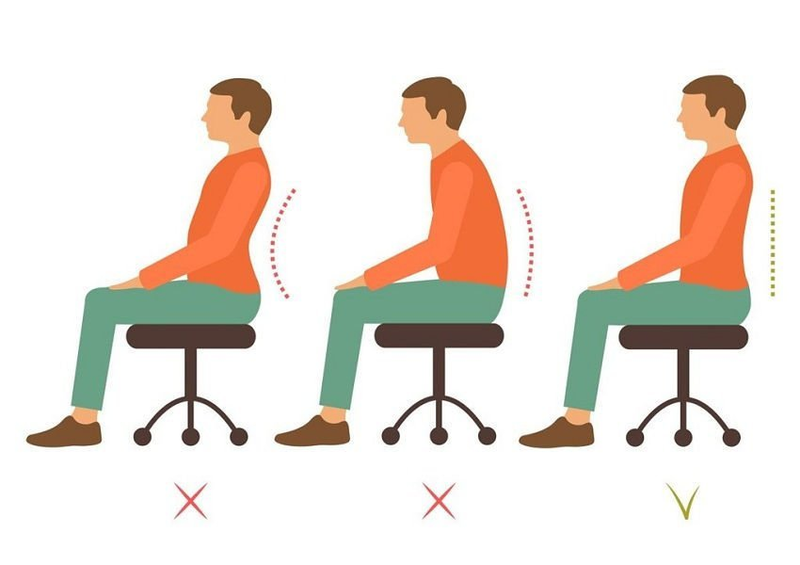 You can overcome the effects of too much sitting with a little savvy.